How can I delete my mailbox? How can I view email properties? How can I configure how mailto links are handled in different browsers? How can I copy a message from the error console? What does the “read-only” mode mean? How can I disable senders' profile pictures? Why am I required to enter captcha numbers during authorization? Attention. If you can't remember your security question answer or you don't have access to the phone number you listed, then you can't delete your mailbox. See the Change phone number section for more information. See I don't remember the answer to my security question for information on what to do. All messages will be deleted together with your account. Messages addressed to this account will not be delivered. 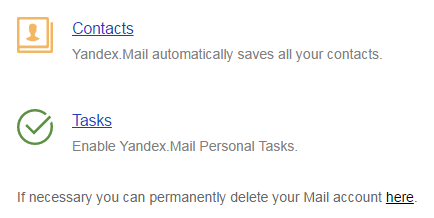 After deleting your mailbox, you will still be able to use your username to use other Yandex services. Go to the All settings section. If you would like to remove your Yandex account completely, see Removing your account. You can use any of the methods below to learn that you have received a new message. You can receive notifications about new messages as soon as they reach your mailbox. Such notifications will be displayed, even if the Yandex.Mail tab is closed. Note. Pop-up notifications are supported in the following browsers: Yandex (version 16.6 and higher), Google Chrome (version 52 and higher), and Mozilla Firefox (version 46 and higher). In Yandex.Mail, go to Settings → Other. Under Notifications, click Show new message notifications in browser. Click Allow in the automatic message Allow https://mail.yandex.ru to display notifications? In the browser menu, go to → Settings . In the Personal information section, click Content settings. In the Notifications section, click Manage exceptions. Select the value https://mail.yandex.com:443 in the list and click Allow. Click Allow in the automated message Allow https://mail.yandex.ru to display alerts?. In the browser window, go to → Settings. Click Advanced at the bottom of the page. In the Personal information section, select Content settings → Notifications. In the Block section, find https://mail.yandex.com:443. Click → Allow next to it. Select Allow notifications in the automated message Do you want to allow mail.yandex.ru to send messages?. Select https://mail.yandex.com in the list of sites. Click Delete site, and then Save changes. Yandex.Mail will display an automated message again. Click the folders you need in the list. You can learn about new messages on your mobile device through a special interface or using the mobile application for “Yandex.Mail”. 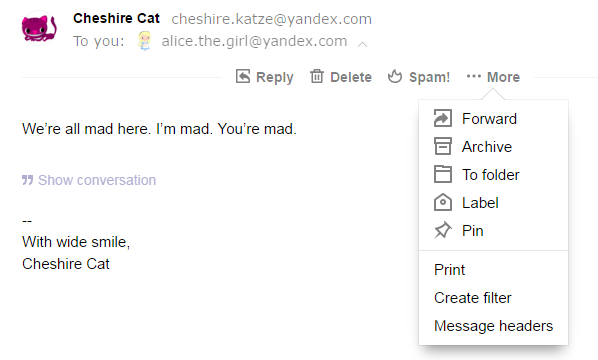 If you have several email addresses, you can receive notifications when you have new Yandex.Mail at another address by going to Settings → Message filters. By default, only the body of the message and the header showing From, To, Date, and Subject are displayed in the user's mailbox. Information from the message headers can help fight spam or resolve a technical issue with your mailbox. To view the full message headers in Yandex.Mail, click on the page for reading the message, and choose Message headers. You can also view the full source of the message in any of the email clients that you use or in other email services. Open the email and click on Other actions → Show source . Right-click on the message and select Special → Source text of the message. Select the message in the menu and go to View → Message → Long headers. Open the message. In the More menu, select Show original. If you use Outlook.com, Hotmail.com, or Live.com, open the message, go to the Actions menu, and select View source text. Open the message, go to the Actions menu, and select Full header. A screenshot is a snapshot of your computer or mobile device screen that you create using standard tools or a special program. You can learn to take screenshots by reading the How to take screenshots article. mailto links are links that contain an email address and open the mail program. To use them to go directly to the Yandex.Mail compose message page, configure the mailto protocol handler in your browser. Log into your Yandex.Mail account. Click in the right part of the SmartBox. If the Yandex.Mail button extension is enabled, mail links will open in Yandex.Mail. 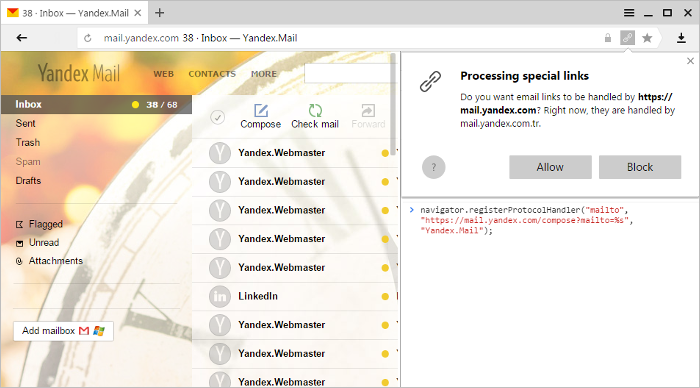 Enable the Mail extension in Yandex Services. Go to the Yandex.Mail page. Click Allow in the dialog that opens. Select Use Yandex.Mail in the right. Click in the address bar. Click Content settings in Privacy. In Handlers, select Allow sites to ask to become default handlers for protocols. Information from the error console can help resolve a technical problem with your mailbox caused by software conflicts (browsers, extensions and addons, firewalls, antivirus programs, etc.). Use the keyboard shortcut Ctrl + Shift + I or choose Tools → Developer tools in the menu. Go to Filter → Errors. Perform actions that cause the error. If any messages appear in Errors, expand the window to fit the entire screen and take a screenshot of the contents. Take several screenshots if you need to scroll down to view the entire contents. For additional information, you can also take a screenshot of Network contents. Press the F12 button or choose Developer tools in the menu. Right-click the mouse in any area of the console and disable the options Warnings, Messages and Log. Leave the Errors option selected. Perform actions that cause the error. If any messages appear in the console, right-click the mouse in any area of the right column and choose Copy all. To open the error console, press the keyboard shortcut Ctrl + Shift + J or click the button in the right upper corner and select menu option Web development → Browser console. Make sure that the Errors option is checked on all tabs — just click on the icon on each tab. Attention. If you click on the name of the tab itself rather than the icon , you will disable error checking. Make sure that error checking is enabled (the tab is blue). Perform actions that cause the error. If any messages appear in the console window, expand the window to fit the entire screen and take a screenshot of the contents. Take several screenshots if you need to scroll down to view the entire contents. You can install Firebug, an addon for Mozilla Firefox, which has advanced features for the built-in error console. Click the icon in the top right corner of the screen to open the Firebug console. In the window that opens, go to Console. Open the error console. Click the Opera button in the top left corner and select More tools → Enable developer tools. To open the error console, press Ctrl + Shift + I or go to the menu Developer tools → Web inspector. In the window that opens, go to Console. Use the keyboard shortcut Ctrl + Shift + I or choose Developer tools → Web inspector in the menu. Open the error console. To do this, click in the top right corner of the screen , open the menu Preferences → Advanced, and check Show Develop menu in menu bar. To open the error console, click Ctrl + Alt + C or click in the top right corner of the screen, and select Develop → Show error console. In the window that opens, go to Console. Open the Settings menu and click Show advanced settings on the bottom of the page. Open the menu Service → Browser properties. In the Security tab, select the Internet zone and click Custom level. Set Active Scripting and Run scripts of Java applications to Enable. Click OK to save changes and restart Internet Explorer. Click the icon in the top right corner of the screen and open Preferences → Security. If Mail is undergoing maintenance, you will see the message Our servers are currently undergoing scheduled maintenance. Therefore, you can currently only use your mailbox to read and send messages at the top of the page (in the two-panel interface) or in the bottom left corner of the page (in the three-panel interface). During maintenance, your mailbox is only available for sending messages or viewing those you have already received. You cannot make any changes, for example, by moving messages to other folders or changing mailbox settings. The “read-only” mode may display an outdated status of your mailbox. If you have received or sent messages, they will not appear in the list of messages until maintenance has been completed. On completion of maintenance, mailbox details will be updated and all messages received and sent during maintenance will be visible. If you do not wish to see senders' profile pictures in each line of the message list, open Settings → Other, uncheck show sender's profile picture and save changes. A wrong username or password has been entered several times in a row. Check if you are entering correct details. If you are using a mail program or a built-in email client in Opera, make sure your details are entered correctly. If your LAN settings allow several users to use one network address, Yandex identifies them as one visitor. In this event, captcha numbers may appear if other users in your network unsuccessfully attempted to log into Yandex. Contact your network administrator to resolve the problem. A lot of generic emails were sent from your mailbox and our system marked them as suspicious. For more details, see the I got a message that my "Email can't be sent, because it appears to be Spam" section. You are also recommended to check your computer for viruses as some malware is used for automatic password matching.